Pretty. 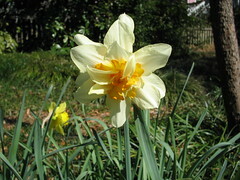 My husband planted daffodils around our mailbox years ago. For some reason a crew paving the road moved our mailbox over about 30 feet. So now the daffodils come up in a random clump 30 feet away from our mailbox.